A zoomed-in view of a slice of the three-dimensional map of the universe. Red areas have more gas; blue areas have less gas. The black scale bar in the bottom right measures 1 billion light-years. The largest-ever three-dimensional map of the distant universe has been created using the light of the brightest objects in the cosmos. 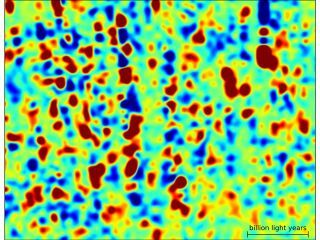 Normally, researchers make maps of the universe by looking at galaxies. Scientists from the Sloan Digital Sky Survey relied on the light of the brightest objects in the cosmos, quasars — brilliantly luminous beacons powered by giant black holes. As light from a quasar voyages to Earth, it illuminates clouds of intergalactic hydrogen gas that absorb light at specific wavelengths depending on the distances between each quasar and these clouds. This leads to an irregular pattern of quasar light known as the "Lyman-alpha forest." To make a full three-dimensional map of the universe, the researchers relied on 14,000 quasars. The map reveals a time 11 billion years ago, when the first galaxies were just beginning to come together under the force of gravity to form the first large clusters. "The most exciting thing for me personally is proving wrong everyone who was telling us that it is never going to work," Slosar told SPACE.com. The use of the Lyman-alpha forest in creating a 3-D map was unproven, "a large investment of time, 20 percent of a big international project, and it sort of had to work. But we were the first to show that it actually works. So, while we haven't yet discovered anything amazing about the universe itself using this technique, we demonstrated that it does work and that we will very likely discover new things." These observations came from the Baryon Oscillation Spectroscopic Survey (BOSS), the largest of the four projects making up the latest phase of the Sloan Digital Sky Survey. When BOSS completes its observations of about 140,000 more quasars by 2014, astronomers can make a map 10 times larger than the one being released today. "With that much data, we're bound to find things that we never expected," said researcher Patrick Petitjean, a quasar expert at the Institute of Astrophysics of Paris. For instance, the ultimate goal of such maps is to study how the expansion of the universe has changed during its history, which could shed light on the mysterious dark energy that seems to drive the accelerating expansion of the universe. "Dark energy is one of the most surprising discoveries in physics in the last 20 years," Slosar noted. "Nobody has a foggiest idea of what it could be. So we study it by studying the expansion history and growth of structure in the universe. To study these we make maps of the universe at different epochs." By the time BOSS ends, "we will be able to measure how fast the universe was expanding 11 billion years ago with an accuracy of a couple of percent," said researcher Patrick McDonald of Lawrence Berkeley and Brookhaven National Laboratories, who pioneered techniques for measuring the universe with the Lyman-alpha forest and helped design the BOSS quasar survey. "Considering that no one has ever measured the cosmic expansion rate so far back in time, that's a pretty astonishing prospect." The scientists could, for example, "discover that dark energy actually kicked in 11 billion years ago rather than 7 billion as predicted by simplest model and that would be just mind-blowing," Slosar said. "The potential for discovering anomalies is great." The scientists detailed their findings May 1 at a meeting of the American Physical Society in Anaheim, Calif. Follow SPACE.com contributor Charles Q. Choi on Twitter @cqchoi. Follow SPACE.com for the latest in space science and exploration news on Twitter @Spacedotcom and on Facebook.